One of the most controversial and exciting forms of chess around, the Armageddon tiebreaker is a relatively recent development in the world of chess. This tiebreaking method came about in response to situations in which a tie between two players must be broken, but playing long games simply isn’t practical. With an Armageddon tiebreak, a tournament or match tie can be broken in a matter of minutes, with no risk of a draw extending the situation. The use of the Armageddon tiebreaker is controversial, particular at the World Championship level; luckily, in high-level events, it is often used only as a measure of last resort, and no World Championship match has ever made it to (or near) an Armageddon tiebreak. In an Armageddon or “sudden death” tiebreak game, the players first draw lots to determine which color they would like to be. The exact specifications – particularly when it comes to time limits – may vary, but the same general structure is always in place. The player with the white pieces is given five minutes on the clock. 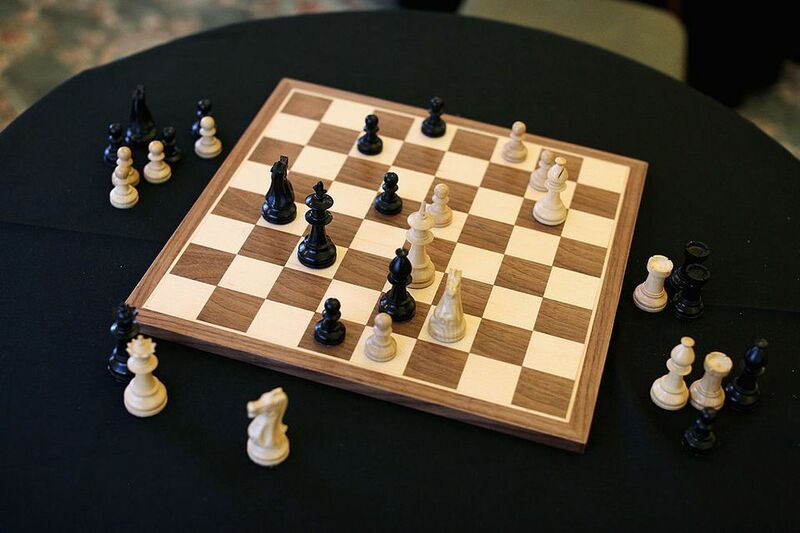 Meanwhile, the player taking the black pieces features a reduced amount of time – usually four minutes. However, the player with Black has the advantage of winning the game (and thus the match or tournament) if they can hold White to a draw. Variations change the exact amount of time given to each player (six minutes vs. five minutes is a common change), as well as whether or not a delay or increment will be used. For instance, in this World Chess Championship, an Armageddon playoff would have seen White have five minutes vs. four minutes for Black, with a three-second increment that kicked in only after 60 moves had been played. There are some rather drastic downsides to the Armageddon format. Players often feel that giving Black draw odds is simply too much of an advantage, and ending major tournaments in a game played in just a few minutes can feel wrong. One alternative that has been used in some tournaments – including editions of the US Chess Championships, and the recent Extreme Chess Championships – is a system of continuing to play games until someone manages to win. In these events, an initial game is played at a certain time control: as an example, let’s say Game/30 with a five-second increment. After choosing for colors, the game is played. If either player wins, the match is over. In the case of a draw, the players immediately switch colors and play a new game, but this game isn’t played at the same time control; instead, the players much play with the amount of time remaining on their clocks, whether that’s 29 minutes or ten seconds. This process continues (including playing more games and reversing colors) until someone wins a game. Another alternative is to make a slight tweak to the normal Armageddon structure. In some cases, organizers have attempted to use a bidding process in which players bid for the right to play the black pieces in the Armageddon tiebreaker. Players “bid” time; essentially, they tell the arbiter how little time they’d be willing to take on the clock in order to have the right to play Black and get draw odds. In our above example of a G/30 tiebreaker, for instance, one player might bid 25 minutes, and the other might bid 23. The second player would then play Black with 23 minutes on their clock, while the first would get White with the full 30 minutes. What Do Titles Mean to Chess Players?